Here are some examples of notices that arrive too late to be of use, or at such a time as to cause significant grief. The site is back to 100% normal capacity and fully operational. If you stopped sending traffic you can begin sending it heavily again! Thanks tremendously! Back to normal? Stopped sending traffic? Huh? There was NO prior notification sent to affiliates that any trouble existed with the site. It would be better NOT to send the 'update' at all in this case, as it only served to make affiliates question how long the site had been down and how much revenue they'd lost during the outage. This one really made me wonder if the affiliate manager had a clue. It arrived with the subject line: URGENT: Change your links on August 29! The email was received on August 28th, 2001. What's " XYZ2.com™"? XYZ2.com™ will be everything that XYZ.com™ is, but better. We've improved our functionality and made the sign up process even easier. We believe these changes will encourage more of your visitors to become members...and that means higher commissions for you! Associates area now at http://associates. XYZ2.com and choose from the great new selection of banners, tiles and linking options. 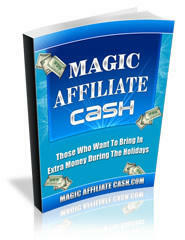 Super Affiliate Handbook and that could translate into increased commissions for you! Click below to log in to the Associates Program to choose your new links, but please note they will not be functional until August 29th! So, in effect they wanted their affiliates to change and upload all their new links at exactly midnight on August 29th, 2001. Let's see. August. No one goes on vacation during August, right? No, of course not! Especially NOT in the Northern Hemisphere where this merchant is based. So, there was absolutely NO chance that affiliates might return from a week-long holiday to discover that they'd paid to get traffic to a site on which dozens of links to XYZ.com were no longer valid. No, not a chance. I find it absolutely unbelievable that anyone, especially a businessperson, could be so thoughtless and inconsiderate. Although the company apologized for their 'oversight', they didn't offer to compensate those affiliates who lost out when they couldn't change their links in the nick of time. I was fortunate in that I was handy to my site and could change my links immediately, but I've severely curtailed my promotional efforts for this company until they prove themselves capable of showing respect and consideration for their affiliates. Two years later and I'm still waiting.